If you missed the email of our latest Teamup Newsletter, you can read it here. Hello everyone! It’s been a while since our last newsletter, and we at Teamup have some exciting news to share. With the holiday season beginning, this mobile update will be one you’ll use over and over. 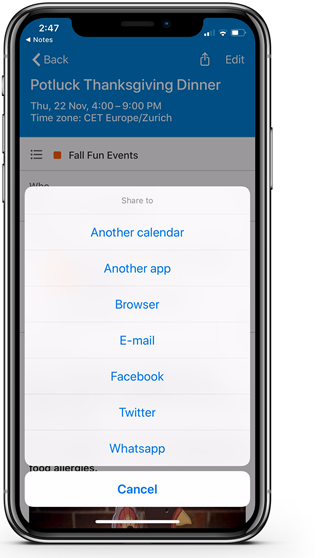 The world has never been so mobile, and now you can find an entire menu of event sharing options on your Teamup mobile apps. If you haven’t updated to the latest version, please do so in the App Store or on Google Play. Share an event as a webpage, via email, through another app, or on a social media platform, all directly from your mobile device. It’s quick and easy, and makes party invitations, event planning, holiday work scheduling, and more much faster. Custom fields are a much-loved feature for Teamup users, and now they’re also available on our mobile apps. Custom event fields are a unique feature of Teamup; they allow the calendar administrator to create their own event fields with single-line text entry, single choice, or multiple choices. You can choose to have the event field contents show on the event title in the calendar view, too. Update to the latest version of the Teamup mobile app in the App Store or on Google Play to enjoy these powerful features on the go. We are happy to share this exciting development: Teamup user accounts are a new, optional service. They’re free for all Teamup users, and provide a central way to access all your Teamup calendars from your calendar dashboard. 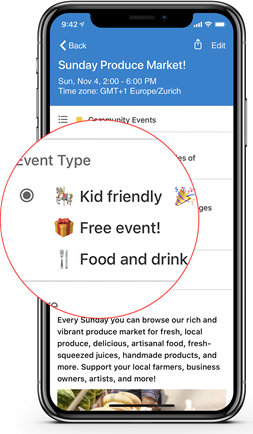 You can also set up and manage event reminders from your user account – yes, the reminder feature that so many of you asked for is finally here! Remember, user accounts are optional and are not required to access your calendars: You can access and use any Teamup Calendar as usual, with the unique calendar link. We’ve been collecting practical ideas and tips into a series of quick tips, which you can access on our blog under the Quick Tips section. Each quick tip provides a brief introduction to a feature, use idea, or method that can make Teamup Calendar work even harder for you. It only takes a couple of minutes to read! If you want to know more, follow the “Learn More” links at the bottom of each Quick Tip. Do you have a smart method or unique set-up to share with other Teamup users? Send us your tip and we might feature it as a Quick Tip on our blog! We’re currently looking for talents to join our distributed global team as User Support Specialists and more. See Open Positions. Share Your Story and WIN a Premium Subscription! We love hearing from Teamup users about the unique and efficient ways they use Teamup Calendar to power their businesses, organizations, and communities. One of our most recent user stories is about a group of volunteer researchers: the Reserve Otter Monitoring Program in Castroville, California, US. This team of citizen scientists in the field uses a Teamup Calendar to schedule field assignments and collect field data. You can read their story here. We would love to hear your story, too. There are a million ways to use Teamup and your unique approach is one of them. What does Teamup do for you? Share your story to inspire others and you might also win a one-year Premium subscription for free! Submit your story here by December 15. We’ll select the 5 most inspiring stories, and award each one a one-year Premium subscription, free. As we enter the holiday season, all of us from Teamup Calendar wish you love, joy, and many reasons to celebrate.